Did you ever wonder how low you can go?! The Dead Sea is your answer. You see, it is the lowest place on the planet. About 1,300 feet (or 400 meters) below sea level. The Dead Sea has got to be one of the wonders of the natural world, and a must for your trip to Israel. I have to say that the whole area around the Dead Sea has a kind of eery but cool feel to it. It's hard to explain. It's just one of those environments that are so unique and so quiet that you can feel you're on another planet. Why is it called the "Dead" Sea? Well, the sea got its name because it is sooooo salty, that nothing lives in the water (well, almost nothing). But don't worry, the waters are actually perfectly safe for us humans. In fact, it's widely agreed to have great health benefits (see more on this below)! Where is the Dead Sea located? This unique salty "sea" is located on the border of Israel and Jordan, about an hour's drive east of Jerusalem. If you want to see exactly where it's located, check out this map of the Dead Sea area, where you can also see the locations of the health beaches and hotels and the other sites in the area which you might want to visit (Masada, Ein Gedi and Qumran –which you can read more about further below on this page). 1) The Dead Sea in itself is actually a misnomer. You see, it's not really a sea. In actual fact, it's a big lake. 2) It is really easy to float on the waters of the Dead Sea due to its high salt content. You can actually read a newspaper while floating on the water if you wanted to. This unique floating phenomenon is probably half the reason people go there. 3) The north western shoreline is where the health beaches, hotels and other tourist services are. 4) The two therapeutic beaches are Neve Zohar and Ein Bokek. 5) The water is not just full of salt – it actually contains about 21 different minerals such as magnesium, potassium and calcium. 6) Because of all the natural salt produced in the Dead Sea, Israel has become a significant supplier of minerals to the world. 7) The incredible concentration of salt is also responsible for the healing effect that this sea is famous for – especially good for people with skin conditions. So actually, the whole place can be considered one big natural spa. 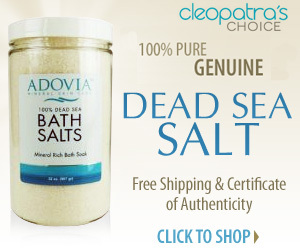 If you can’t make it to this amazing natural phenomenon any time soon, but you still want to enjoy the benefits of the mineral mud and salts, you can visit Cleopatra's Choice - these guys carry authentic Dead Sea mud and salts for very reasonable prices. You can even use the salt and mud to treat skin problems like scabies. But there are also plenty of things to do besides floating and rubbing mud on your body. Did you know that history was literally written right off the shoreline of this salty lake? In the surrounding area you can find the Qumran caves, the place in which the famous Dead Sea Scrolls were found. The Dead Sea Scrolls are the oldest known biblical documents. The Qumran caves are located only about a mile away from the shoreline. Click here and I will tell you briefly about Qumran and the famous Scrolls. Masada and Ein Gedi are two more fantastic attractions in the Dead Sea area. Masada is a palace/fortress overlooking the salt sea – there is an amazing true story behind this site. The second – Ein Gedi – is a true natural oasis with springs and diverse plants and wildlife. I summarized the important information about Masada and Ein Gedi on this page. Taking a jeep or a camel tour. There's also plenty of great hiking spots. A few years ago a friend of mine drove us to the Dead Sea, and along the way we just parked on the side of the road and hiked up one of the hills alongside. The pictures below will give you a good idea of what it was like – an amazing experience in a unique setting and landscape. Here I am on my hike up one of the hills in the Dead Sea area. Don't look down! Or at least - don't fall! A view from the hill of the Dead Sea below. This picture should give a better idea of how high we climbed. We hope you enjoyed our overview of the Dead Sea area!